Relationships are used to explain how different people are connected to each child or employee. For example a relationship may be defined as a family member like mom, dad, grandparent, aunt, etc. Other people outside the family like emergency contacts, authorized pickup people, baby sitters, and the child’s doctor may also be connected to the child. People connected to an employee may include a spouse, child, emergency contact, etc. From the Procare Home screen go to Configuration > System > Data Management > Status & Relationships. Dbl-click either Child Relationships or Employee Relationships. 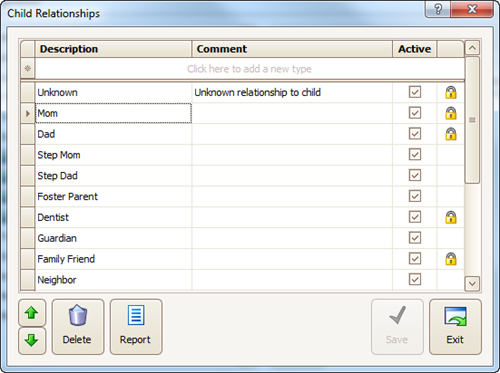 To create a new relationship click the top (blank) line and enter a Description like “Family Friend” with a Comment (optional) if it requires further explanation. Then click Save. Continue adding new descriptions clicking Save after each one. Use the Up & Down arrows to change their order if needed, then click Exit. To make a change simply type over the existing Description. This will automatically update any person to whom the old description was assigned. Note: You cannot type over relationships that have a lock; those are reserved by the system and cannot be changed. Link related people to a Child, or Employee.